Biologists agree that natural selection is the mechanism responsible for adaptation. In contrast, debates persist about the relative contributions of selection, randomness, and historical contingency to molecular evolution and biological diversification. The context of this debate has shifted some in recent years with an increased emphasis on genetic drift in declining populations, contemporary natural selection, and evolution on ecological time scales. An understanding of recent and short-term evolution is of course important if we hope to predict or alter how populations will respond to rapid global change. These issues prompted us to think about how one might experimentally measure genetic drift and natural selection over short time scales. We were particularly interested in the genomic consequences of these processes, in other words, how much of the genome is affected by selection in a given generation and how much might drift alter allele frequencies across the genome. Our study was catalyzed by conversations between Patrik and Jeff Feder in the dark bars of Berlin, Germany (in 2008 and 2009) concerning their growing dissatisfaction with inferring evolutionary process based solely on patterns of genomic variation. These discussions led to the idea that natural selection and drift could be measured directly by combining a field transplant experiment with genome-wide DNA sequencing of the organisms involved in the experiment. 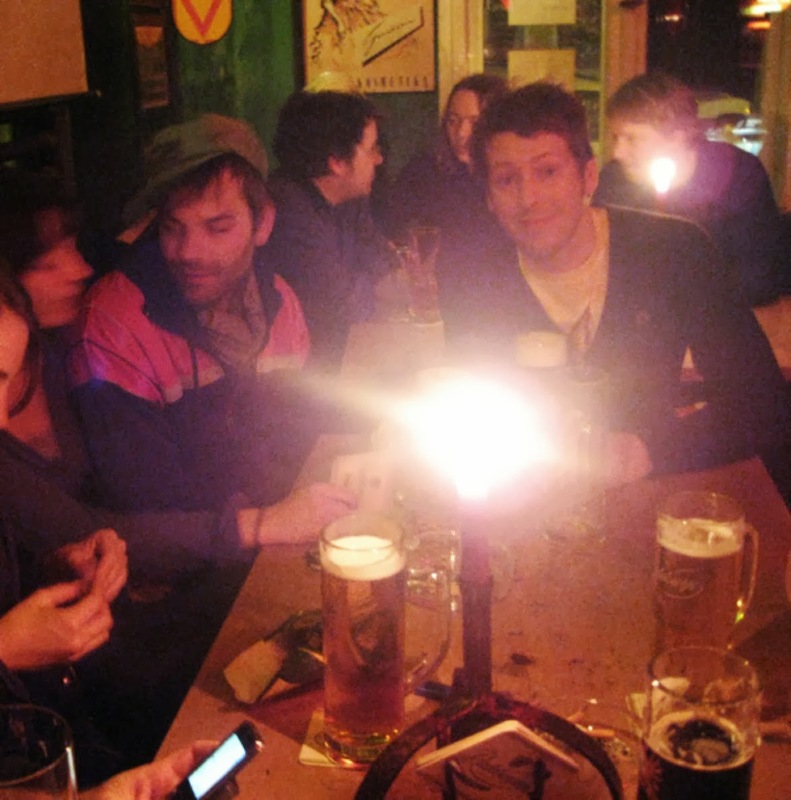 Trying to figure out how to measure selection directly at the genomic level, circa 2009, in Berlin, Germany. We quickly decided on a species of stick insect (Timema cristinae) as an ideal focal species for our experimental genomics study. This was driven in part by the natural history of this species – host specialization and low dispersal ability allow for ecologically relevant mark-recapture studies – but also in part by it being the main system Patrik knows how to work with. 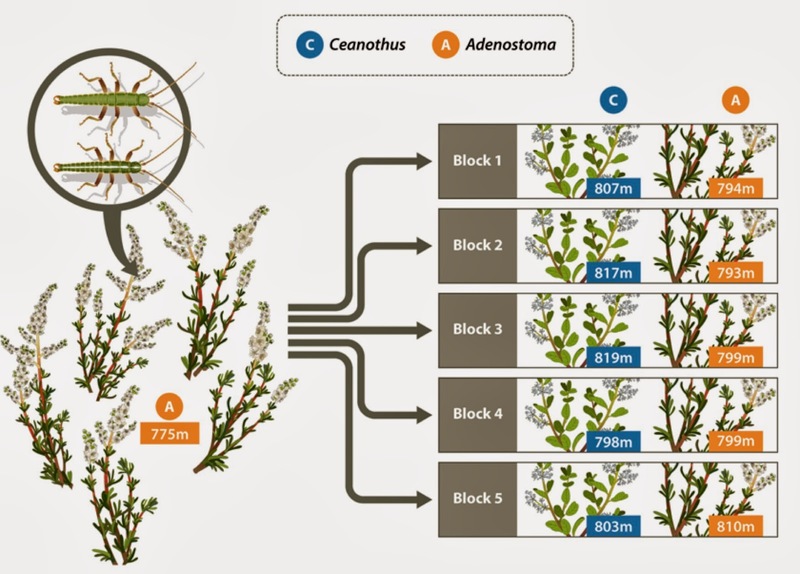 In terms of natural history, two specialized ecotypes of this species have evolved and are adapted to different host plant species: Adenostoma fasciculatum (a small, shrubby Rose) and Ceanothus spinosus (a larger, tree-like Buckthorn). These ecotypes differ in several ways, with the most obvious difference being the presence versus absence of a highly heritable white dorsal stripe, distinguishing the ‘green striped’ and ‘green unstriped’ morphs (see this earlier post by Tim Farkas). Striped individuals are better camouflaged and suffer less predation on Adenostoma whereas green individuals are better camouflaged on Ceanothus. Thus, we would expect stick insects transplanted from their native host plant to the alternative host to experience stronger effects of natural selection (higher rates of mortality due to selection) that would affect more of the genome, compared to insects transplanted to their native host. Patrik and his students set off for southern California in 2011 to test this prediction (with Patrik feeling more lucid and healthy, and less of an ‘urban biologist’, than the year in Berlin). Our basic plan was to collect hundreds of stick insects, move them to experimental Adenostoma and Ceanothus bushes, and measure evolutionary (i.e., allele frequency) change across the genome caused by mortality of the transplanted stick insects over about a week's time. A key difficulty with this design was that we needed to be able to match the DNA of the stick insects we released with those that were recaptured at the end of the experiment, so that we would know the genotypes of both the founders and the subset of them that survived. We considered several possibilities, including raising the founders in the lab to collect DNA from their feces or discarded exoskeletons. In fact, this was attempted, but the DNA quantity and quality was poor. So, we finally decided to simply remove a portion of a leg from each stick insect before its release. With that the field experiment was underway and 500 stick insects were captured, had their tissue sampled, were released to the wild, and then the subset (140 to be exact) of them that survived were recaptured. The tissues from the survivors and all the initial founding individuals were then ground up for next-generation DNA sequencing. The design of the transplant experiment used to measure the effects of selection and drift on genomic change within a generation. We were rewarded a few months later with hundreds of millions of DNA sequences. Zach and his colleagues (primarily Alex Buerkle and Tom Parchman) then went to work processing and trying to make sense of the sequence data. This required assembling sequences to an early draft of the Timema genome, trying to match stick insect legs with bodies based on the sequence data, and developing the computational statistical methods to analyze the contributions of genetic drift and natural selection to evolutionary change during the experiment. After months of analyses we finally had some answers to our questions and wrote an initial draft of the paper. Thus began the biggest trials and tribulations we experienced over the course of this study. Time and time again it seemed as though reviewers did not appreciate or accept our results and our paper was turned down at journal after journal. The key problem was that our findings were multifaceted, complicated, and nuanced and we didn't really know how to effectively communicate them to our readers. While tiring at times, this experience taught us that as data and analyses continue to grow in complexity it will become ever more important to present and frame scientific results in a manner that allows readers to see the connections and key results that we have identified, while at the same time embracing the complexity that might often simply represent biological reality. We learned from our initial mistakes and were able to close the paper with what is a new record for us: “We thank... 10 anonymous reviewers for comments on previous versions of the manuscript” (the paper is Open Access at Ecology Letters). So, besides how to be better communicators, what did we learn from our study? First, we came to grips with the importance of both direct and indirect selection as drivers of genomic change. Phenotypic selection is transmitted to causal genetic variants that affect fitness (this is direct selection) and to additional genetic loci correlated with these functional variants (this is indirect selection). This distinction has long been emphasized at the phenotypic level, but has been mostly thought of only for tightly linked genes at the genetic level. But statistical correlations are not restricted to physically linked loci (in fact, in our study over 97% of loci were most correlated with distant genetic loci), and given the enormous number of variable genetic loci in genomes the opportunities for correlations and indirect selection are vast. This simple fact means that it will be incredibly difficult to catalog the targets of direct selection. But we can readily estimate total selection experienced by a locus, which is the driver of evolutionary change anyway (particularly over short time scales). Along these lines, we found evidence that hundreds of loci were affected by potentially strong host-associated selection, particularly when stick insects were moved from their native host plant to the novel one. Thus, we detected host plant-associated selection with stronger effects of selection on novel host plants. This natural selection was caused in part by variation in the stripe phenotype, but that wasn’t the whole story. In fact, the genetic loci that were most likely affected by host plant-specific selection were not associated with the stripe phenotype. Moreover, we uncovered genomic evidence that the strength of the effect of selection varied with the elevation of the experimental populations. We think that this nicely demonstrates how genomic analyses can help identify previously underappreciated sources or targets of selection. Finally, whereas we documented rapid and detectable genomic change from natural selection, this was not the sole or even main source of genomic change. Genetic drift was rampant during the eight day experiment. Thus, neutral divergence between the founders and survivors over eight days was similar in magnitude to the genetic differences among natural T. cristinae populations. We think this really highlights how rapidly evolution can occur (by selection and drift), particularly in small populations that move into new environments (our founder populations began with 50 individuals). These conditions might be common when species ranges shift or are fragmented. Climate change and evolution - or not?